Get creative with an art class! Or join us for a lecture or movie-night discussion group. ​We offer classes in a variety of media and for students of all ages and skill levels. Our Plein Air group meets around town for on-location painting. 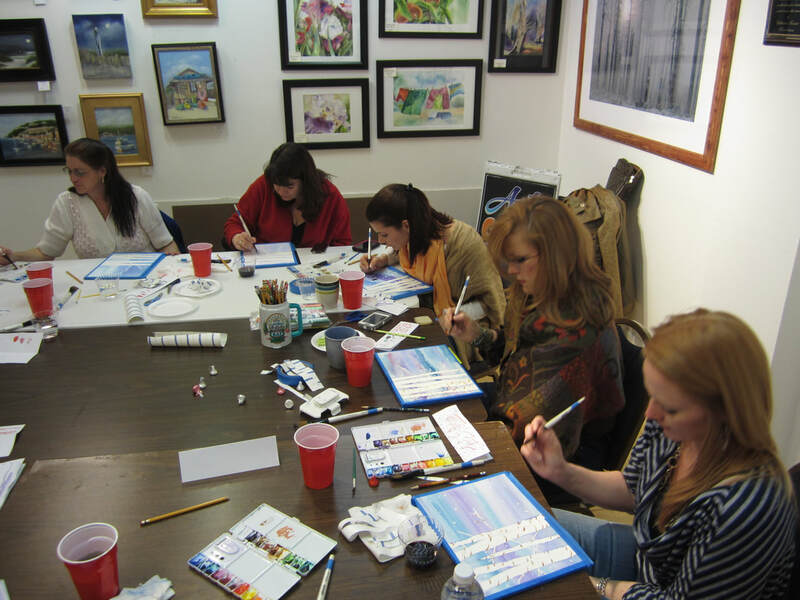 We also offer classes for artists to build their art business. No matter what your skill level, we can help you explore your creativity and increase your skill level. Our classes range from experimental "paint nite" classes for true beginners to advanced techniques in specific media. You can learn the basic techniques, further your technical skills or expand your range of media. We also offer classes for artists who are developing their art as a business. Pottery classes have just been added to the schedule! Click the Register Now button to see the current class offerings and to register on line. The class list can be filtered by class type, age, or date using checkboxes on the left column. Do you need a place to make art, but are not ready to commit to a full-time studio? Our flex space is available for drop in sessions. Bring your own supplies, work on your creative projects and then hang out with us for lunch if you like. Not only will you benefit from our creative atmosphere, but the resident artists are always happy to discuss your work and offer help if asked. For details about open studio times and to register call 425-6671 or visit us to get started. You'll see that there are two different fees listed for class tuition. Our Annual Supporters receive discounted tuition. Click here to become a Supporter! Do you love to teach art? We would love to talk with you about it. Propose a class or apply to become an instructor by clicking here. "I enjoy every moment of these classes. The fellowship and the instructions received are valuable. My confidence is always built up." "Tons of helpful hints for technique and 'how to do' example demonstrations. Very worthwhile course."